Shine in crystals. This detailed pullover couldn't be sweeter. Pair it with colored denim, pencil skirts or your famed maxi skirt. So many opulent options! Am a buxom 2X and I sized down to 1X - fits perfect. The V neck with highlighting crystals is very flattering. Got the Black and went back for the Cobalt Blue, both cute! The black has only white crystals and looks dressier. The blue has some blue crystals and is a bit more casual. 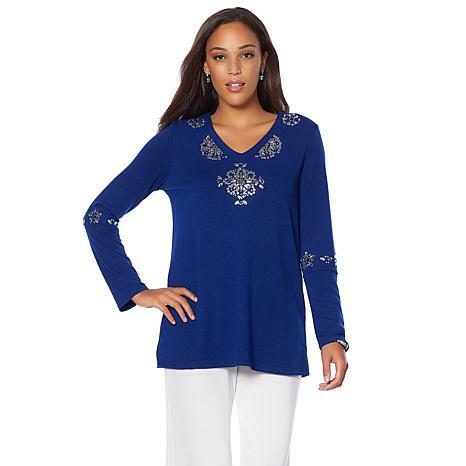 Love the comfortable tunic style and stretchy fabric. The arms are long on me - to my knuckles but easy to hike up. Nice quality. I have bought top from other online shopping shows and the quality was so bad even for the price I had to send it back. And the fit on this top Is perfect. I have not had a piece of clothing strike me like this in a long time. I have some of Moans tops and I love them all! But when I pulled this out of the packaging and held it up I gasped, it was that gorgeous. It does run a little large. I usually take an XL and I had to send it back for a large but that is a good feeling. I love how long it is. It will cover my leggings and the material is divine! I am going back for 2 more colors ! Joan Joan Joan you never cease to amaze me!!!! Love this sweater, great fabric, color, design and sizing. Real classy and elegant, just like Joan. This is my 2nd one, loved the first one so much.